Linkedin has recently introduced a number of new features to enhance their member’s user experience. Some of these have been rolled out with big announcements via the Official LinkedIn Blog and others I’ve come across when publishing a LinkedIn article. In this week’s article I share a snapshot of some of these new features and how to access them. On June 28th, 2018, LinkedIn announced that this feature will be coming in the next few weeks to the LinkedIn iOS and Android apps. This means posts that are in a different language than you speak will now show a “See Translation” button within the LinkedIn Feed, the recent activity section on someone’s profile, and the post detail page. 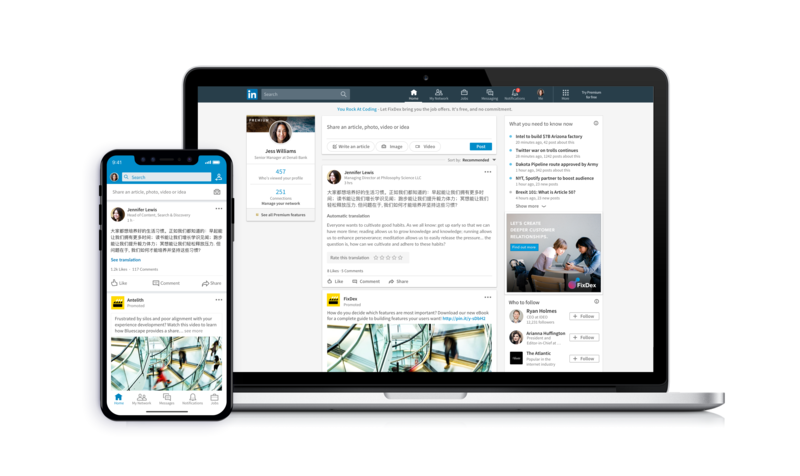 The “See Translation” feature will initially be available in more than 60 languages including Spanish, Japanese, and German to a majority (so, not all) LinkedIn members on desktop and mobile web. The languages supported will continue to be added. Will Australia receive this feature? We hope so! On 28th June, 2018, LinkedIn announced the introduction of the LinkedIn QR code, positioning it as a simple way to quickly find the profile of someone you just met and connect on-the-spot. The idea of this new feature is to replace the need for a business card and use LinkedIn instead. I like that this feature helps move offline conversations into online connections, which is one of the most powerful ways to leverage LinkedIn for your career or business. There is definitely a move to having access to everything via your device. As with the recent Find Nearby feature, here’s another example of LinkedIn responding to a changing landscape for how we stay connected. How does LinkedIn QR Code work? LinkedIn QR code is available now in the LinkedIn iOS and Android apps globally. 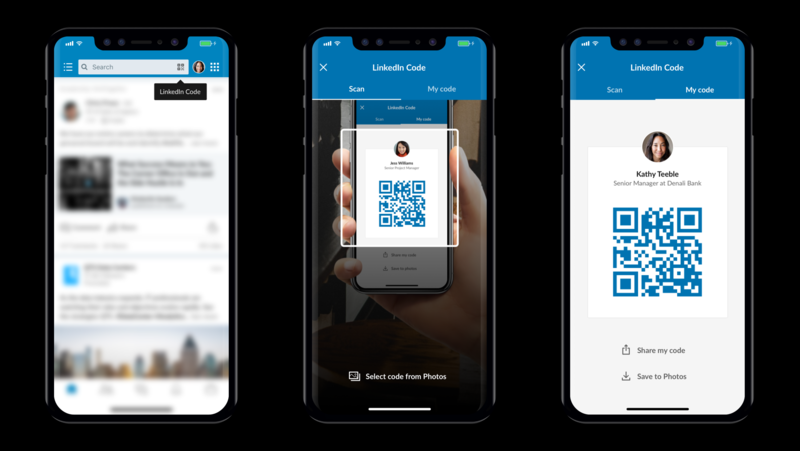 LinkedIn’s suggesting that the next time you’re at an industry event and meet someone that you want to keep chatting with, you can open the LinkedIn app and scan their QR code to connect and stay in touch. The functionality of this feature will therefore depend on the user and their preferences for business cards versus QR code scanning. If you are a regular reader of Think Bespoke’s blog you’ll know that I still value business cards. In this article I share my thoughts on why business cards still matter in a digital world. Here are the instructions from LinkedIn’s Official Blog on how to get started. Open your LinkedIn app on iOS or Android and tap the QR code icon in the search box found on the Home tab. From here you can scan someone else’s LinkedIn QR code and you will be taken to their profile where you can check out mutual connections, common interests, and send a connection request. You can also upload a LinkedIn QR code image from your phone. To find your own LinkedIn QR code, tap on “My code.” If you’d like to share your code through iMessage, email, or other apps you can do so directly from this page (available now on iOS and coming soon to Android). You can also save your code to your photos. Sometimes LinkedIn adds new features and doesn’t announce them. The Share a Draft LinkedIn article feature is a new feature I discovered when training the HR and Marketing representatives of an organisation this week. Please follow this discussion on LinkedIn, where I first shared this feature and can answer any questions you may have about it. One of the main benefits of this feature is being able to send the link of your draft with others to review before pressing publish. What are your favourite LinkedIn features?